Wouldn’t you love to go inside the minds of those elusive millennial shoppers and find out what they think of your store? We sure did. That’s why, when we found this recent University of Florida study, we were all over it! Although definitions vary slightly, millennials are the large generation born between 1982 and 1996. There are 80 million of them in the U.S. with some $600 billion spending power annually. And, contrary to what you expect, they are more likely to make a purchase in a store than online. CNBC reports that 71% of millennials like to visit multiple stores to find deals as they shop. So, U of F asked millennials to visit stores around Gainesville – some discounters, some mall stores – and document what stood out to them. As it turns out, store design and appearance play a large role in whether millennial customers will want to shop. 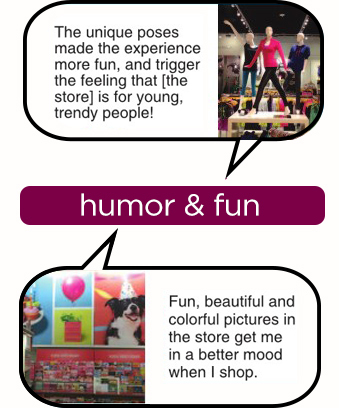 88% commented on displays: The fixture materials that stood out to millennials? Wood, mirror finished, and “shiny”. The most popular displays varied, from those with mannequins, to seasonal displays and interactive displays that encouraged shoppers to connect via social media. Millennials described the ones they liked most as “unique,” but were just as concerned that it stayed neat and fully stocked. 79% mentioned store graphics. Yes, they do notice your photography and they like the ones with “witty messaging.” Some earned strong praise with words like “stunning,” “beautiful” and “colorful.” But one millennial called out a store’s inconsistency when the sign showed a model in a white dress that read “Dream in White” and the items for sale next to it were not white. 78% noticed store layout. Millennial survey respondents said they preferred stores with wide aisles and they also paid attention to things such as wall color and decorative details. 74% talked about store style. They used words like “art deco,” “home-like,” “unique,” “glamorous,” “trendy,” “upscale” and “luxurious” to describe store environments they liked. 58% commented on lighting. Study participants especially appreciated it when they saw “classy” and “beautiful” light fixtures, including a chandelier in one store, backlighting and an oversized lamp in another. Customer service was noted by 11.6% of millennials in the study, with more males (60%) commenting on it than female shoppers. And, although one would think that customer service is about people, a majority of the positive mentions involved helpful signage. Millennials consider signs about store policies, wayfinding graphics, and do-it-yourself price check scanners to be customer service. Steven Cohen is Vice President of Creative at GSP, a one-stop retail services provider specializing in store reimaging, graphics, visual merchandising and marketing solutions.